Hey everyone! I hope you're all having a lovely week so far, today I've been super stressed trying to sort out bills etc. for our new house, who knew moving was so stressful eh? Anyway, today's nail art is something a little different. I was sent a couple of polishes by Gelish last week, and I knew straight away I wanted to create some nail art with them. I wasn't really sure where I was going to take the design, but then it hit me that I've never tried stamping with gels, and it was SO much easier. I'm not claiming these are anywhere near perfect, but they're a lot better than I can normally manage, and that's because Gelish makes it easy to sort out any mistakes. I also decided to experiment a bit with a different camera and natural light, I've included the images after the jump so you can compare the difference. I love how clear they are, but at the same time I don't think I'm able to make a jump to using natural light because I do so many designs at night. But I'd like to see I can set the new camera up with my lightbox to see how they look then. But I'd love to hear your thoughts on the new images! For these I used Gelish - Give Me Gold*, and Gelish - A Little Naughty* from the After Hours collection. 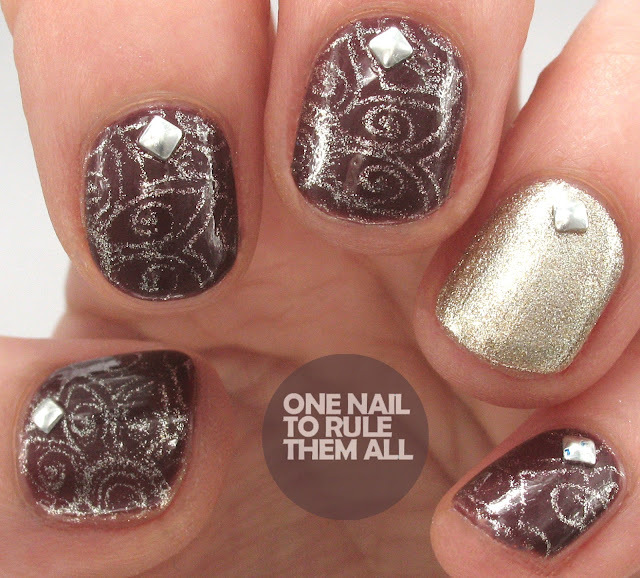 Then I used studs from Avon, and the BP-L008 plate from Born Pretty Store, along with this stamper from Mo You. Gorgeous mani Alice! I love the stamping and the studs. The daylight photo looks stunning to me!